Six PhD students were announced as the winners of the ATLAS Thesis Awards 2014 from 28 nominations received. 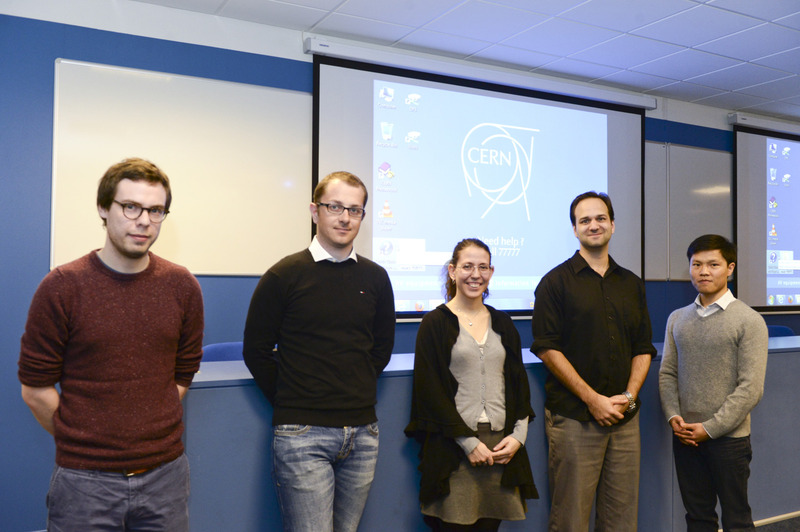 The winners – Andrew Chisholm, Kun Liu, Marcus Morgenstern, Priscilla Pani, Dennis Perepelitsa, and James Saxon – were given certificates and an engraved glass model of the ATLAS detector during a ceremony on 19 February 2015 at CERN, Geneva. "The nominations we received were of a high standard and the quality shows that ATLAS will be in good hands in the future," says Simon Connell, chair of the ATLAS Thesis Awards Committee this year. The Committee nominates a thesis for the Springer Thesis series and this year, Andrew Chisholm's 'Measurements of the χ_c and χ_b quarkonium states in pp collisions with the ATLAS experiment' has been forwarded as the collaboration's nomination. "The final few months of my PhD, spent writing my thesis and finalizing all of the analysis work, were probably some of the most stressful yet rewarding months of my life. I feel honoured that the collaboration considered the work I did during my PhD to be worthy of this award," says Chisholm, who finished his PhD from the University of Birmingham, where he is now a postdoctoral fellow. Writing theses is usually the toughest and busiest time in a graduate student's life, and all of the winners say they learned a lot from the process. "I could see things evolving and learned a lot just thinking about many details that I hadn't thought about earlier," says Marcus Morgenstern, who graduated from Technical University of Dresden, and is now working on radiation protection. Students depend on their mentors, fellow students and colleagues for support during the thesis writing process and all of the winners wanted to share their moment with those who had helped them over the years. "As honoured and happy as I am, I realize there is a large number of people who share the merit for the prize and without whom none of this would have been possible," says Priscilla Pani, who graduated from Universiteit van Amsterdam and currently works as a postdoctoral fellow at Stockholm University. "My colleagues gave me lots of chances and a very warm environment to work in," says James Saxon. "I 'grew up' in the Transition Radiation Tracker community, working on electronics and Data Acquisition, and was lucky to be working in the Higgs to gamma gamma group during the Higgs discovery. My colleagues gave me lots of chances and a very warm environment to work in," says James Saxon, University of Pennsylvania graduate, now an Enrico Fermi Fellow at the University of Chicago. Besides proton-proton collisions, the LHC also delivers proton-lead and lead-lead collisions for a month every year when its running. Dennis Perepelitsa completed his thesis using data from the LHC at CERN, Geneva, and from the Relativistic Heavy Ion Collider in Brookhaven National Laboratory. "In graduate school, I observed a puzzle in RHIC data that was counterintuitive to the established understanding in nuclear physics, and then used the tools of the LHC to try to resolve it. The results opened more questions than they answered but that's what research science is all about," says Dennis Perepelitsa, who has a PhD from Columbia University and is now a Goldhaber Distinguished Fellow at Brookhaven National Laboratory. Perepelitsa's thesis also won the RHIC/AGS Thesis Award.